"Harold Bloom, the self-proclaimed “unbelieving Jew” and distinguished scholar, recently characterized Joseph Smith as “a religious genius,” stating that the religion Smith founded “is truly a biblical religion.” More recently, Carl Mosser has written concerning the doctrine of that religion: “Mormonism’s heresies are legion; they are also very interesting and often unique in the history of heresy.” Biblical or heretical? Of these two reactions, the charge of heresy has been far more common, especially among conservative Christian critics, who consistently draw a circle that leaves Joseph’s Mormonism out. 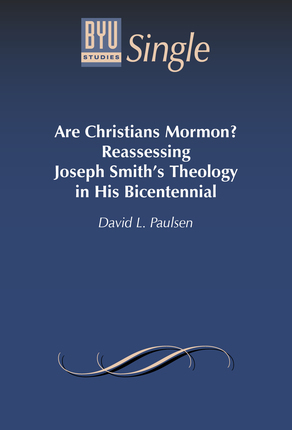 Now that Latter-day Saints and others have commemorated the two-hundredth birthday of Joseph Smith (1805–1844), founding prophet of The Church of Jesus Christ of Latter-day Saints, it is time to reassess how far Christian thinkers have come in appropriating theological insights once owned uniquely, or nearly so, by Smith and his followers."